The Royal Pharmaceutical Society is delighted to announce that the new MedicinesComplete experience is here. Whilst retaining the expert content that you have come to rely upon, we have created a new platform with a more intuitive search function and a modern design to seamlessly navigate across our breadth of content. At the heart of these improvements is your need to quickly and easily discover medicines information to make rapid, well informed decisions. 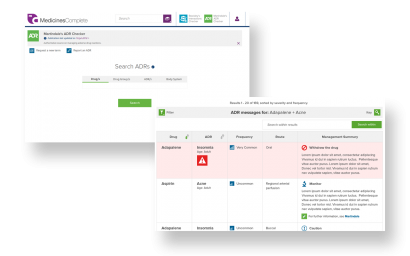 New to MedicinesComplete in December 2018, Martindale’s ADR Checker is a quick and easy tool to support you when managing patients with adverse drug reactions. This January we are also pleased to bring you the Palliative Care Formulary, the expert source of drug information in palliative and hospice care. 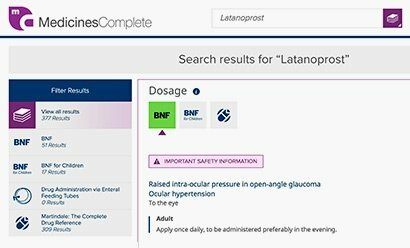 We have carefully considered how to improve readability and the discovery of content by presenting a clear and consistent design across all the content in MedicinesComplete and the addition of quick links on every page. The introduction of filters and the ability to view content by groups makes it easier to uncover the breadth of information within specific resources. Recognising that selecting the right dose is critical in patient care, the new Dosage Card feature provides you with the confidence to quickly and reliably answer your dosage queries. 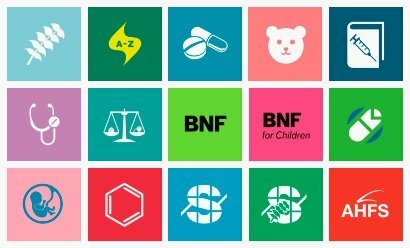 As soon as you’ve searched for a drug term, the Dosage Card presents a snapshot of the content available in the BNF, BNF for Children and Martindale. 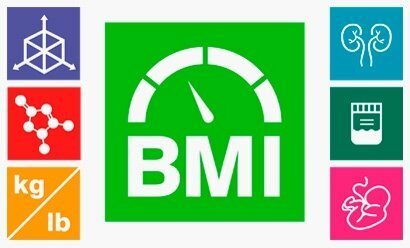 With minimal disruption to your clinical workflow, use our collection of tools to carry out simple conversions and calculations. For organisations, we recommend you contact your Account Manager for further information. If you have any general questions, please contact our Support Team via email or on +44 (0)207 572 2266 (our office hours are 9am to 5pm GMT, Monday to Friday).